Quentin Tarantino at the 2015 San Diego Comic-Con Internaitional. 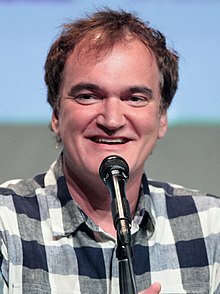 Quentin Jerome Tarantino (/ˌtærənˈtiːnoʊ/; born Mairch 27, 1963) is an American film director, screenwriter, producer, an actor. His films are characterised bi non-linear storylines, satirical subject matter, an aestheticization o violence, references tae pop cultur, thair soondtracks an featurs o neo-noir film. ↑ Quentin Tarantino Biography (1963–. Advameg, Inc. Retrieved August 20, 2012. This page wis last eeditit on 27 Mairch 2017, at 22:17.